French and Indian War (1754-63) grew out of competition between Great Britain and France for land in North America. As part of the larger Seven Years War in Europe, colonists and Indians were caught up in a bitter struggle that eventually deprived the French of Canada and the Indians of much of their land. North Carolina colonists and the Cherokee fought first as allies, then as enemies. The North Carolina colony raised 2,000 men, half of whom initially fought mostly in Virginia and New York. Later the troops concentrated on defending North Carolina against the Cherokee. The first North Carolina troops, under Col. James Innes, were sent to Virginia, where the governor appointed Innes commander of all colonial forces in Virginia after the death of their leader, Joshua Fry. Innes and 450 North Carolinians arrived in Winchester, Va., in June 1754, but due to a lack of supplies Innes sent most of the men home within the month. On 4 July George Washington surrendered Fort Necessity in southwestern Pennsylvania to the French, leaving the frontier open to attack. In defense, Innes took 40 North Carolinians as part of a larger force of 400 men north into Maryland to join Washington; there they built Fort Cumberland on Wills Creek. In January 1755 Britain sent Gen. Edward Braddock to America to assume command of the colonial forces in Virginia, including Innes's men holding Fort Cumberland and a new North Carolina company of 100 troops under Capt. Edward Brice Dobbs, son of North Carolina governor Arthur Dobbs. On 9 July the French and Shawnee Indians ambushed part of Braddock's army, killing Braddock, killing or wounding 700 of his men, and routing his army. Dobbs and his North Carolina company, who did not take part in the battle, retreated to Fort Cumberland. There Innes tried to stop the flight of Braddock's remaining men, but they marched on to Philadelphia, leaving 300 to 400 sick or wounded soldiers with Innes. As the army collapsed, half of Dobbs's force at the fort deserted and went home. In 1756 three new North Carolina companies were raised, placed under Dobbs, and attached to the British army in New York. There they participated in three more disasters, including the loss of Fort Oswego in August. By the end of the year most of the North Carolinians had returned home, followed by Dobbs in the spring of 1757. With the defeat of Braddock's army and the British losses in New York, French and Indian attacks along the western frontier of the English colonies began in earnest. Only the presence of the Cherokee in North Carolina prevented more aggressive Shawnee attacks. In February 1756 Capt. Hugh Waddell helped secure a peace treaty with the Catawba and Cherokee. Under the treaties negotiated by the governors of North Carolina, South Carolina, and Virginia, the Cherokee would send their warriors north to fight the French and the Shawnee in exchange for supplies and forts (to be built by the English) to protect the Indian settlements. That winter a disastrous campaign against the Shawnee left the Cherokee warriors angry and hungry, and on the way home they raided white settlements in Virginia and North Carolina for food and horses. Only the continued negotiations kept them from breaking with the English and siding with the French. Between 1755 and 1757 North Carolina concentrated on shoring up its frontier defenses. The colony built a fort at the Moravian settlement of Bethabara, Fort Prince George in Lower Cherokee territory, and Fort Loudoun in Upper Cherokee territory. Fort Dobbs, named for Governor Arthur Dobbs, was a small battery on the eastern end of Bogue Banks intended to defend Old Topsail Inlet (modern Beaufort Inlet) and the port of Beaufort. Construction began in 1756 but was not completed; the fort was never armed or used. Another Fort Dobbs, in Iredell County, was built during the same period. Fort Granville, named for John Lord Carteret, Earl Granville, was located on the southern side of Ocracoke Inlet near the new town of Portsmouth to guard both the inlet and the harbor. Work began on Fort Granville in 1755, but it was never finished, although garrisoned and armed with 11 old ship guns. The site was abandoned at the end of the war. In 1758 refugees from the western frontier and the north streamed into North Carolina to escape the war. Overwhelmed with these emigrants in the winter and spring, the Moravians at Bethabara built an additional fort around its all-important mill and moved refugees there from the village stockade. They also fed hundreds of Cherokee warriors on their way to and from the fighting in Virginia. Maj. Hugh Waddell's men took part in the capture of Fort Duquesne in November 1758. The Cherokee were very dissatisfied with their treatment during the campaign and returned home angry with the colonial forces. In 1759 a significant number of Cherokees turned against the English. In April and May a raiding party killed as many as 20 settlers along the Catawba and Yadkin Rivers. The forts at Bethabara then filled with 120 refugees, outnumbering the Moravians, who established the town of Bethania to help relieve the overcrowding. That summer typhus broke out in Bethabara, killing many refugees and Moravians. The South Carolinians forced a peace treaty on the Cherokee in 1759, but it did not last. In January and February 1760 the Indians besieged Fort Prince George and Fort Loudoun and swept through the backcountry settlements, killing everyone they found. Colonial rangers from Fort Dobbs and Bethabara attempted to rescue settlers and fought the Cherokee. In June Col. Archibald Montgomerie destroyed the Lower Cherokee settlements and attacked the Middle Cherokees. After a defeat on 27 June, Montgomerie withdrew to Fort Prince George and then to Charles Towne (Charleston, S.C.). The Virginia expedition led by Col. William Byrd to relieve Fort Loudoun failed in July. The fort surrendered to the Upper Cherokees on 7 August, and its commander and much of its garrison were massacred three days later. In January 1761 Lt. Col. James Grant arrived in Charles Towne with British regulars. By mid-June his army of 2,150 men won a battle near modern Franklin and destroyed 15 Middle Cherokee towns and 1,400 acres of corn. To the north, Waddell's North Carolina troops joined Byrd's Virginians and moved against the Cherokee. Meanwhile, under the threat of additional invasions, the Indians sued for peace; on 18 Dec. 1761 they signed a treaty ending the war. While the colonists in North Carolina, South Carolina, and Virginia were fighting the Cherokee, the British won the war in Canada against the French. Quebec fell in September 1759, and Canada was surrendered to the English at Montreal in September 1760. On 10 Feb. 1763 the Treaty of Paris officially ended the Seven Years War in Europe and the French and Indian War in North America. The many hundreds of refugees who fled to North Carolina had a significant impact on the colony. Some of them stayed, adding to the population. Yet the French and Indian War slowed the colony's development, ended the migration of German settlers to its backcountry, damaged Anglo-Cherokee relations, and left North Carolina with a huge war debt. The overall cost of the war led Britain to increase taxes on the American colonies, eventually contributing to the American Revolution. Jerry C. Cashion, "North Carolina and the Cherokee: The Quest for Land on the Eve of the American Revolution, 1754-1776" (Ph.D. diss, UNC-Chapel Hill, 1979). 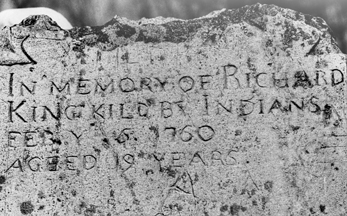 Philip M. Hamer, "Anglo-French Rivalry in the Cherokee Country, 1754-1757," NCHR 2 (1925). E. Lawrence Lee, Indian Wars in North Carolina, 1663-1763 (1963). Alfred Moore Waddell, "North Carolina in the French and Indian War," North Carolina Booklet 7 (July 1907). 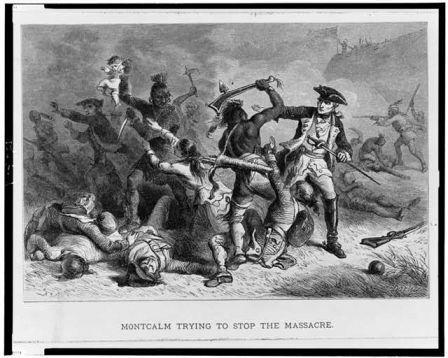 "Montcalm trying to stop the massacre." Engraved by Bobbett, Alfred, ca. 1824-1888(9). Summary from LOC: "Montcalm trying to stop Native Americans from attacking British soldiers and civilians as they leave Fort William McHenry." Image courtesy of Library of Congress. Available from http://www.loc.gov/pictures/item/98505902/ (accessed May 24, 2012). Will there ever be another war like the French and Indian War? I was wandering when this Website was published? Hi, Reilly. Did you mean this particular article? Hi, an ancestor of mine received a land grant from the King for service in the war. It was in What is now Rockingham County. Do you have information on such land grants, how common they were, and the services of the grantees? That's an excellent question and thanks for taking a minute to ask us. Unfortunately, I can find no reputable web resources to easily answer your question. Clodfelter, Michael. 1992. Warfare and armed conflicts: a statistical reference to casualty and other figures, 1618-1991. Jefferson (N.C.): McFarland. The Government & Heritage Library here at the NC State Library does not have this work in our collection but I have requested it through interlibrary loan and will be posting back any information I find when I receive the book. So check back! You can also consult your local library to see if they can obtain a copy for you as well. Thanks for visiting NCpedia! Please visit us again.